The claims for ankle weights include burning fat and building leg muscles by adding to the resistance of your exercise. While there may be some benefit for aerobic and cardiovascular exercises that elevate your heart rate for the sake of burning calories, ankle weights can also increase your risk of injury. For best results, only use ankle weights for controlled workouts that involve strengthening specific leg muscles, such as squats, lunges, kicks and leg lifts. Ankle weights attach to the area just above your ankle joint to provide added weight to your leg motions. The point of the extra weight is to increase the strength of your gluteus, quadriceps and calve muscles due to the additional resistance, resulting in an increased muscle mass over time. However, due to the awkward positioning of the weights above your ankle, strains, sprains and minor injuries are more likely to occur while running or walking. Ankle weights offer the most benefits for strength-training exercises that use the weights to isolate different muscle groups. For example, the leg-lift exercise is intensified by the added resistance as you lie on your back and raise your legs together, providing an demanding core exercise. Sumo squats that involve lifting the legs in succession also work your leg and hip muscles harder when you wear ankle weights, strengthening those areas more than if you were only lifting your body weight. Ankle weights are less effective when it comes to aerobic and cardiovascular exercise. Instead of adding ankle weights to your brisk walking routine, Kent Adams, director of the exercise physiology lab at Cal State Monterey Bay, recommends walking uphill to gain the calorie-burning benefits of increasing elevation. Stair climbing is another incline-training method that outdistances those who claim that ankle weights improve the aerobic impact of your workout. 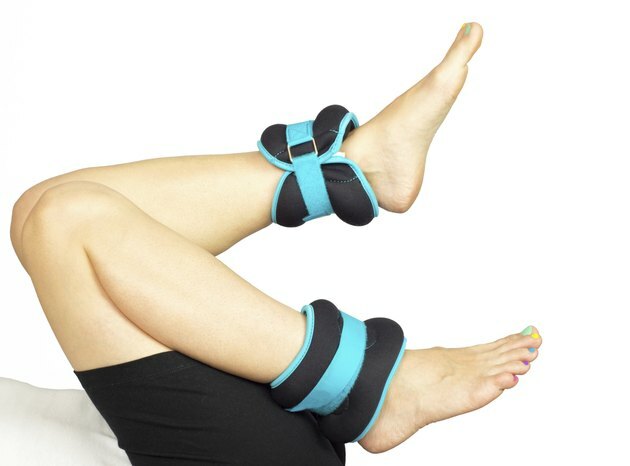 Ankle weights apply increased force on the joints and muscles surrounded the ankle, exasperating existing problems while potentially causing injury. Individuals who are frail or overweight are particularly at risk of the extra strain on their ankles and knees. For best results, talk to your doctor before adding ankle weights to your workout routine.